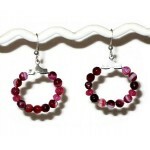 Imagine how gorgeous this fuchsia bracelet and earring set will look on you. The bracelet is adorned with faceted sardonyx agate and jade beads. It is made on expandable wire for a more comfortable fit. Also, it has a silver-plated lobster clasp and chain extender. It can be adjusted from 6 1/2 to 8 1/2 inches. The matching small hoop earrings hang on silver-plated earwires and measure 1 inch across and hang 1 1/2 inches long. This necklace consists of assorted smooth and faceted sardonyx beads, faceted jade beads, fr.. This fancy expandable fuchsia choker features a sardonyx agate drop pendant that hangs approximately..